During the final days of 2012, I had the chance to test Fiasco with two buddies. The game had caught my attention a few weeks ago, but I lacked the players to try it. When my two friends came over, we chose to not run a session of Song of Ice and Fire, but cracked open the PDF of Fiasco and gave it a spin. And boy, was it entertaining! For those who haven’t played Fiasco yet or who haven’t heard of it, let me try to describe it in a nutshell. 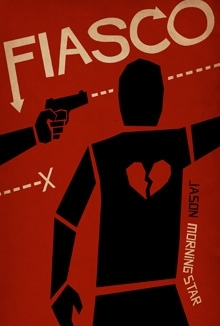 Fiasco is a cooperative, narrative game meant to simulate stories from movies like Lock, Stock and Two Smokin’ Barrels, Fargo or Burn after Reading. Characters are insignificant people with great plans that eventually go horribly wrong. The game lacks what most people look for in a role-playing game: there’s no real character creation, you don’t have a character sheet and there isn’t even a GM! Instead, all players create everything necessary for the one-shot session together, and then have fun telling a fun, dramatic and fatal story. I won’t go too much into the mechanics of the whole game. If that interests you, read one of the great reviews out there or buy the game (for $10, it’s a steal). What I want to discuss, though, is what two sessions of this game have taught me about narrative gaming. You see, I consider myself the kind of GM who gives players quite some power in his games. I listen to their wishes, I ask for feedback after every session, and I allow players to play characters who can achieve a lot in-game. Also, my campaigns focus more on the story than on the numbers: I’d rather have my players create intriguing background stories for their PC’s, instead of seeing them delve through all the sourcebooks to craft a character sheet with points in all the right places. Fiasco, however, told me that this whole approach can be taken a step further, and here’s how. First, ask players to create setting pieces. During the first part of a Fiasco session, all players create stuff for the setting together. One player chooses the relationship between two characters, while another one adds a truckload of TNT as an important object for the game. The point is that all these elements are used during play, and to give every player a way to participate in the creation of the session. Why not use a technique like this in other games? When creating the outline for a campaign, why shouldn’t you ask your players for input? Have them think about the MacGuffin, or describe the town they all hail from. Make sure to give their “pieces” a part in the world, and I believe that they will feel so much more invested in the game. Second, don’t be afraid to hand over control to them. In Fiasco, players take turns in describing and playing in scenes, meaning that there is no designated GM. This is also something you can easily do in your weekly game of D&D or WoD. Point at a player and have him frame a scene for another player at the table. Have everyone chip in to the “design” of the environment, and listen to ideas that come forth from your player’s mouths. Of course, this might derail your planning, but it will also give your players a way to participate in a completely different manner. However, both of these ideas require willing players. If you try to hand over narrative control to someone who is just there to slay monsters and collect loot, you won’t get very far. On the other hand, you need to be wary of power abuse. Some players will use these alleys to sneak in advantages for their character, bringing all kinds of problems to your table. Make sure to be on the lookout for these kinds of shenanigans, and your group might experience their everyday dice-rolling in a new way!